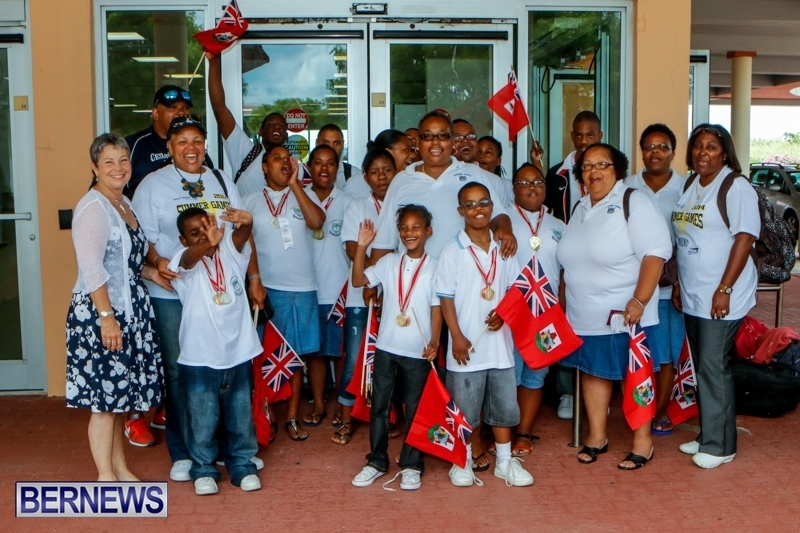 The airport was the scene of celebration this weekend as Bermuda’s team returned home from the Delaware Regional Special Olympics with an impressive haul of medals – having captured a total of 44. Bermuda’s team included students from the CedarBridge Academy Functional Skills Class as well as Somerset Primary students, with the athletes winning 27 gold, 11 silver, and 6 bronze medals. CedarBridge Principal Kalmar Richards also came out to greet her students, saying: “I just want to say how proud I am of everyone, but I want to begin by giving thanks to Ms Zuill and Coach Watts, you do a phenomenal job with your leadership with respect to this awesome event. Bermuda’s team included J’Naysha Maloney, Uriah Williams, Christopher Talbot, Solay Thomas, Dorjah Young, Shaqune Whitehurts, Bridgette Marshall, Mahalia Maynard, Kenlin Perinchief, Kirk Dill, Justin Smith, Nahziri Smith, Azori Stewart, and Del-Che Landy. Well done Bermudas special olympians jewels, you have represented Bermuda well and many thanks to the leaders who assisted them. It was nice to see Somerset Primary students join with them. May God bless you all and have a safe and blessed summer holiday to all of you and to the rest of our teachers and students. Hey now u’lot:-) Congratulation to everyone, for making us here feel sooooo proud!